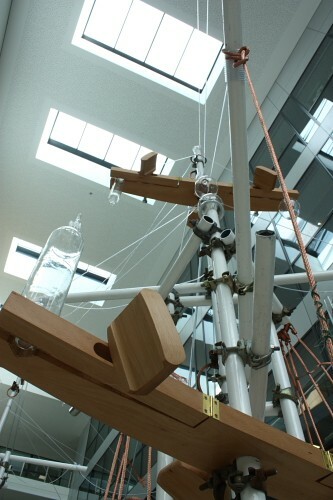 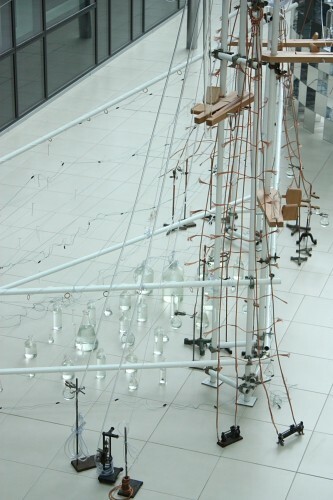 Full scale view of sculpture made from steel, copper, laboratory glassware, handcrafted wooden clamps, pvc tubing, miscellaneous scientific instruments, netting and other parts. 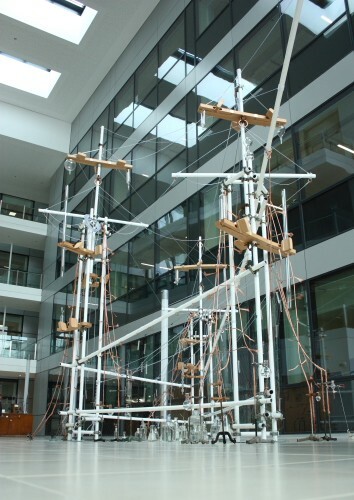 Stands 6 metres at its highest point. 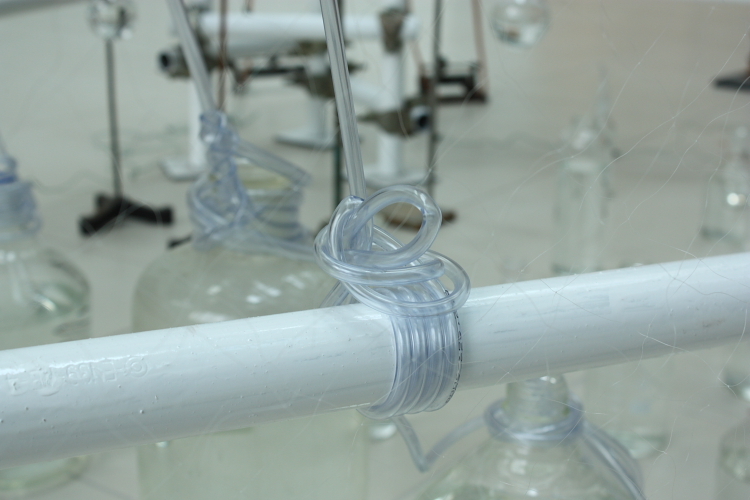 Preview of 'Unknown Shores', 2014. 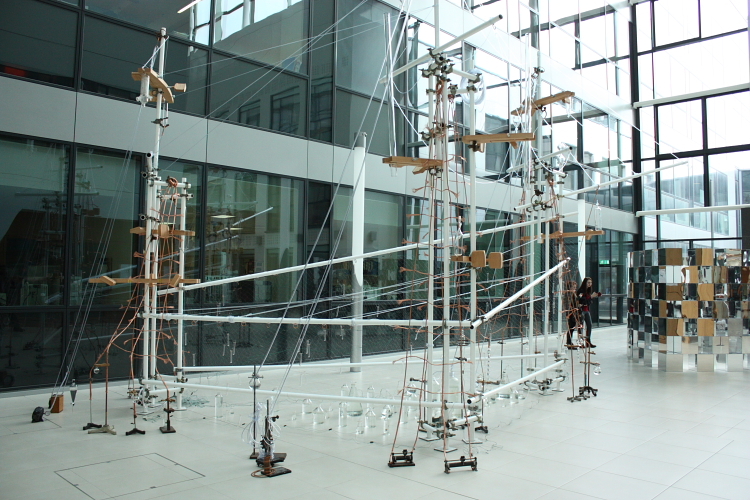 UCD O'Brien Centre for Science, Dublin, Ireland. 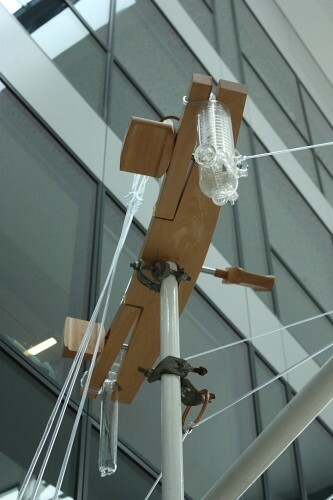 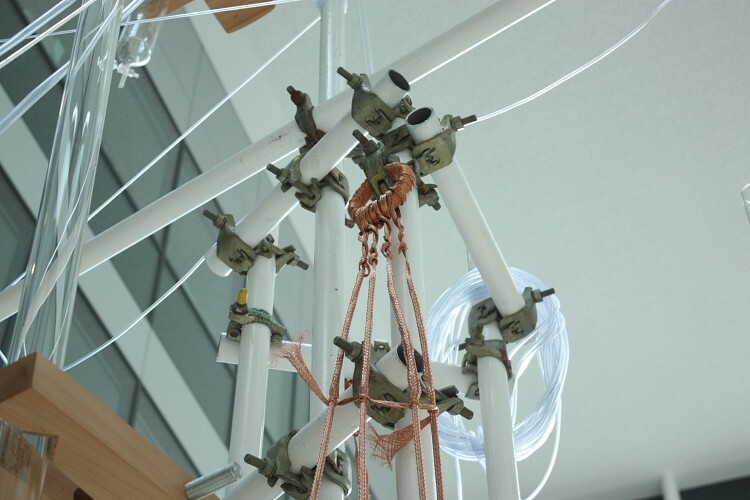 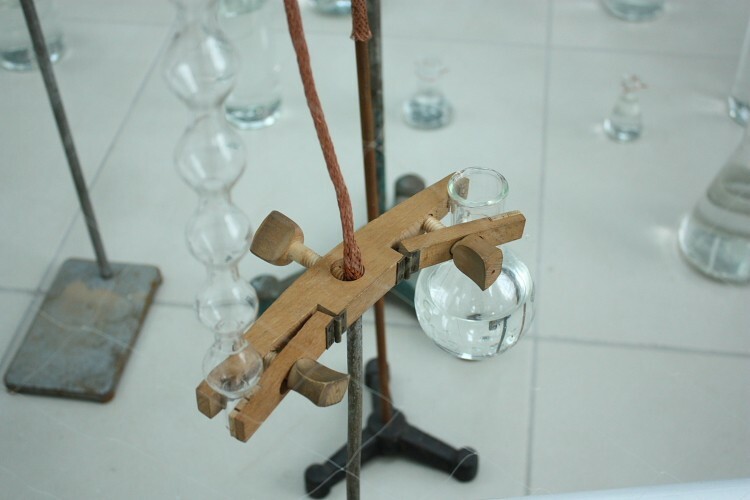 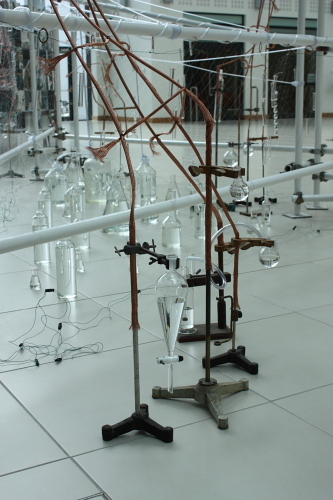 Side view of sculpture made from steel, copper, laboratory glassware, handcrafted wooden clamps, pvc tubing, miscellaneous scientific instruments, netting and other parts. 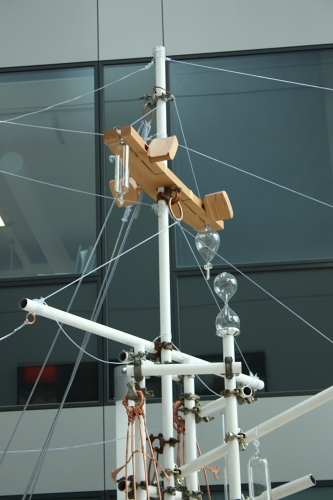 Stands 6 metres at its highest point. 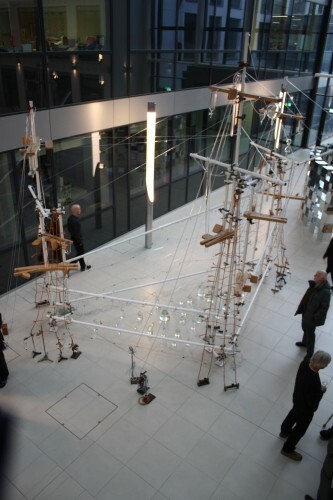 Sculpture viewed from a balcony above. 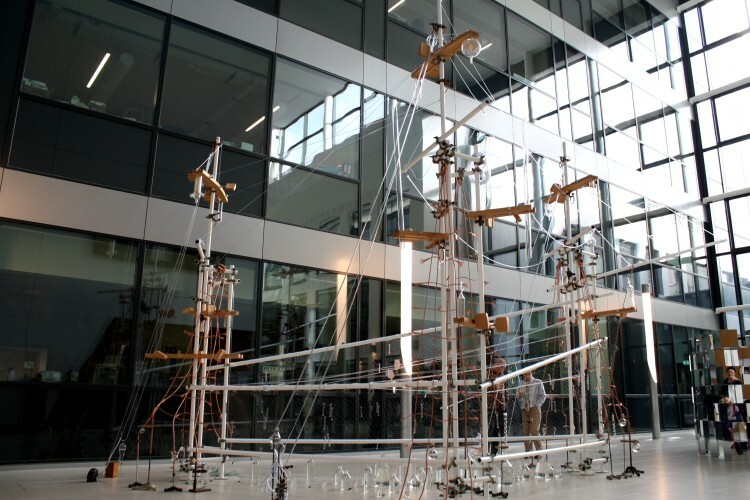 Despite the vast amount of component parts and the use of heavy steel scaffolding as the framework, the sculpture embodied a light and ethereal presence. 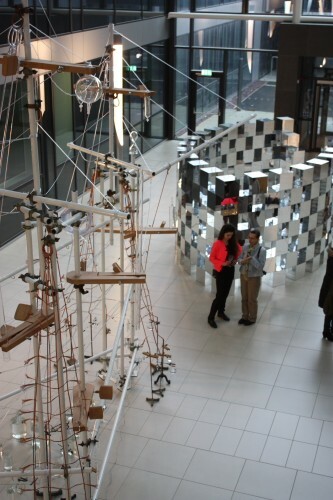 Artist Méadhbh O'Connor (left) discusses the work with a guest at the exhibition preview. 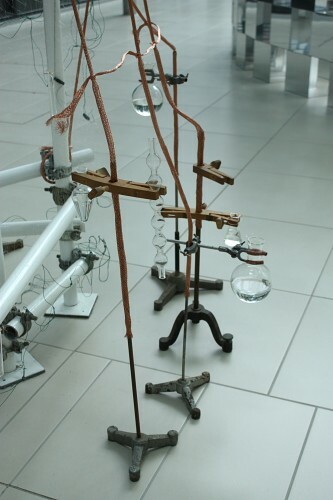 Side view of sculpture made from steel, copper, laboratory glassware, handcrafted wooden clamps, pvc tubing, miscellaneous scientific instruments, netting and other parts. 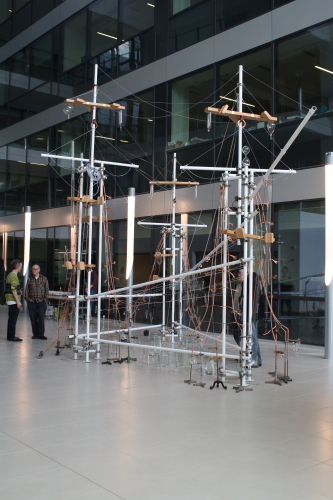 Within 6 x 2.5 x 8.2 metres (H x W x D). 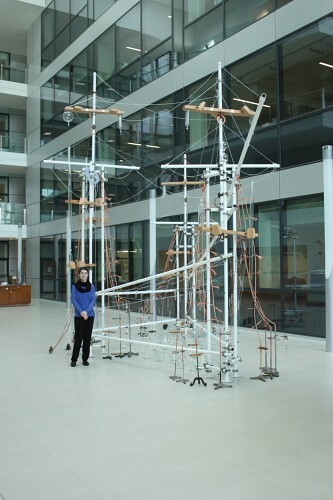 Meadhbh O'Connor with the installation. 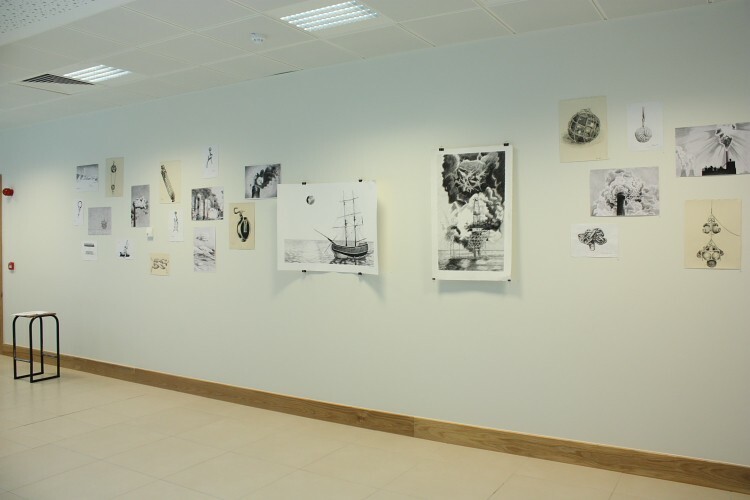 'Unknown Shores' by Méadhbh O'Connor. 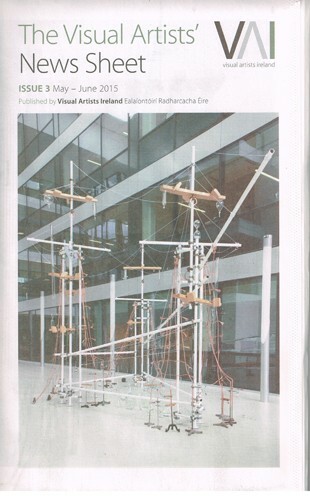 Selected for the cover of The Visual Artists' News Sheet, May/June 2015. 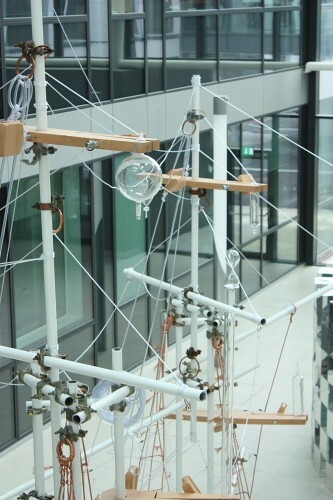 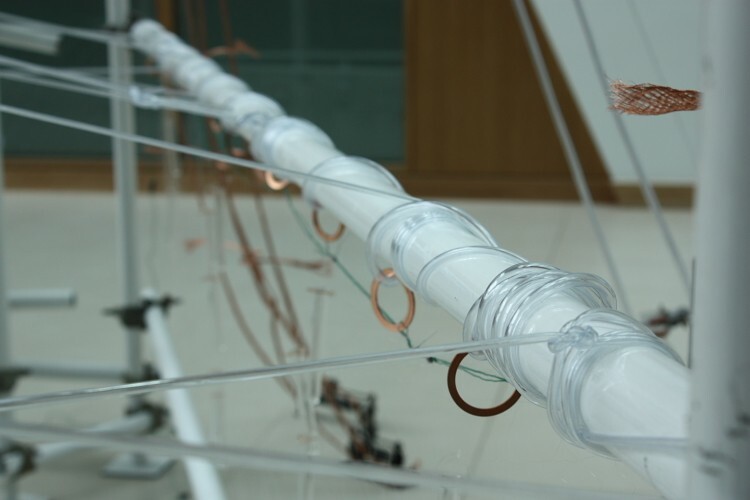 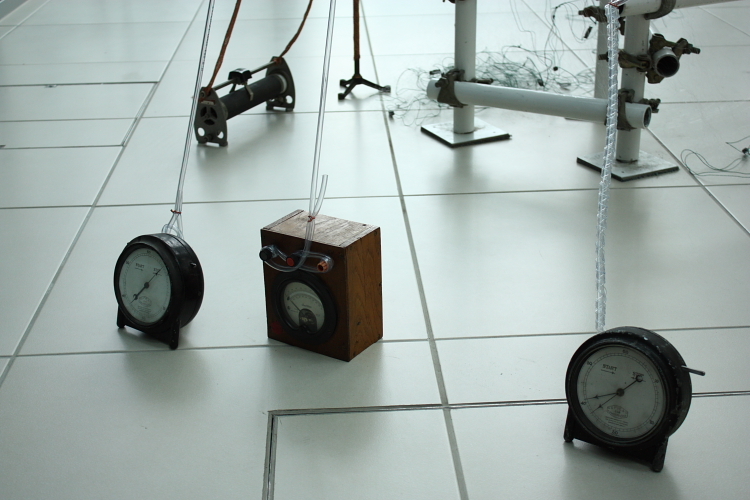 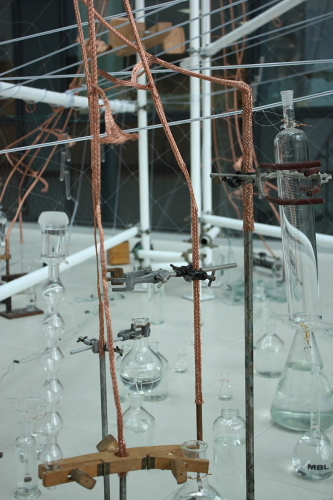 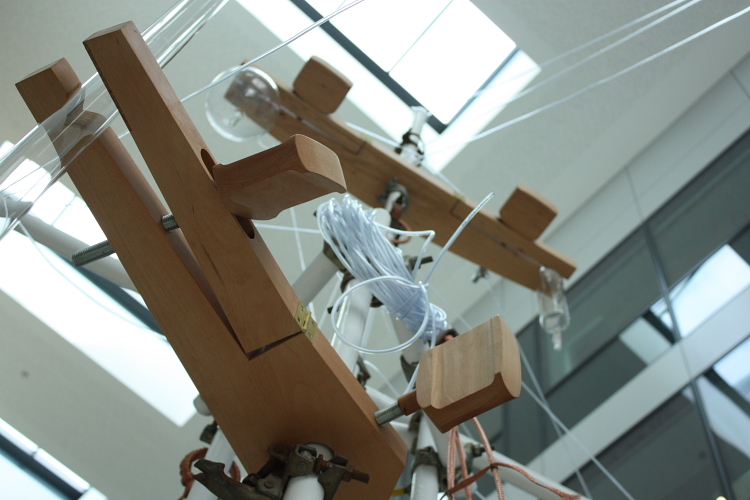 A large sculptural installation composed of: old laboratory equipment salvaged from the UCD College of Science; steel scaffolding; flexible PVC tubing; handcrafted, working wooden clamps; glass tubes; laboratory glassware; copper wire; netting and other miscellaneous parts.Its dimensions were 6 x 2.5 x 8.2 metres (H x W x L).The work possessed a dual appearance of a laboratory and a ship with 3 masts and a prow. 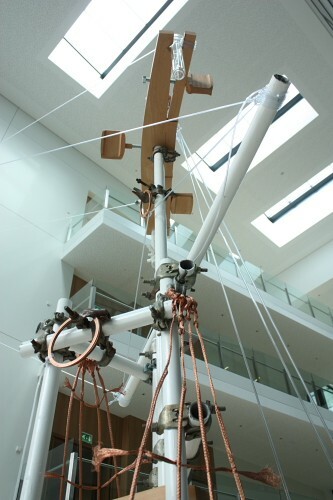 Old laboratory equipment was dotted around the base of the sculpture from which the giant parts and ship’s masts emerged. 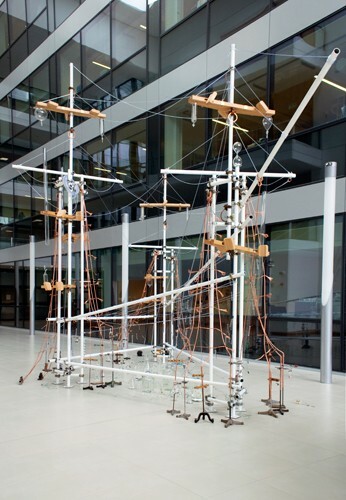 Despite the vast amount of component parts and the use of heavy steel scaffolding as the framework, the sculpture embodied a light and ethereal presence.The ship was rigged using laboratory tubing tied into a variety of nautical knots. 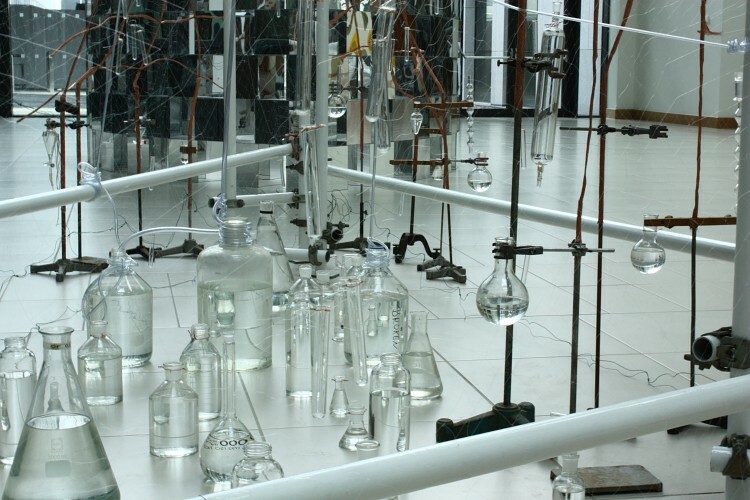 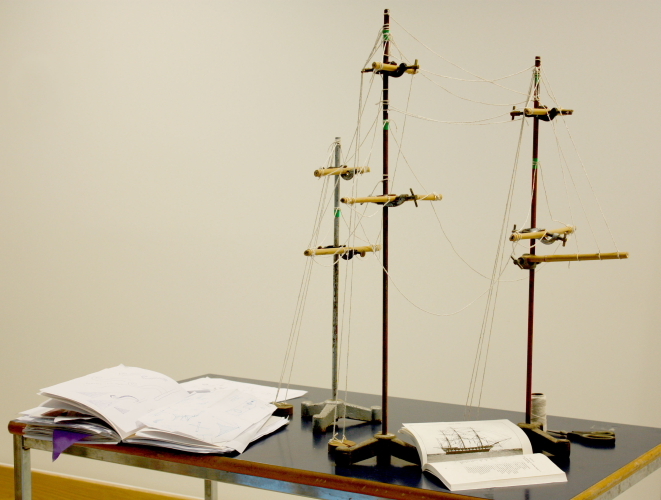 ‘Unknown Shores’, was a major, large-scale sculptural installation built by Méadhbh O’Connor in 2014 at the culmination of her artist’s residency with the University College Dublin (UCD) College of Science. 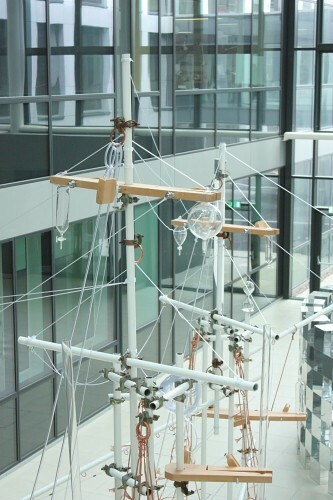 The sculpture, which took on a dual appearance of a ship and a laboratory, was built by Méadhbh to signify the beginning of a journey, or rather taking part in a continuous journey. 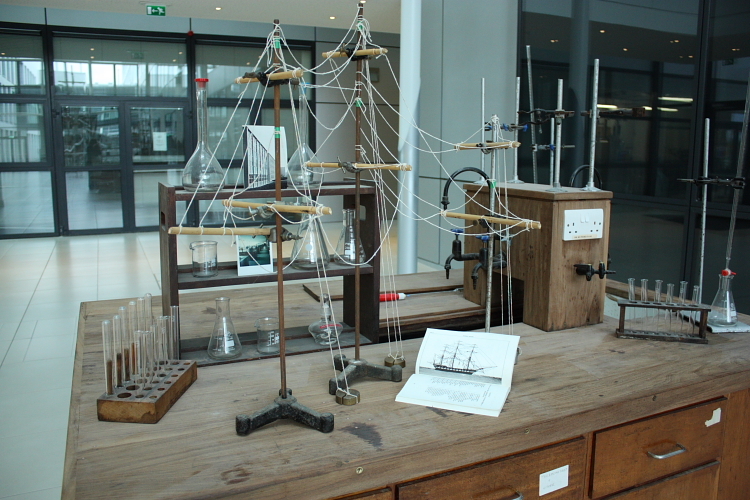 ‘Unknown Shores’ was initially inspired upon learning about the extraordinary voyage Dr. Emmanuel Reynaud (UCD School of Biology and Environmental Science) undertook studying the world’s oceans with Tara Expeditions, a non-profit organisation dedicated to high-level scientific research missions on sea. Emmanuel’s story reinforced Méadhbh’s observation during her residency in the UCD College of Science of scientific enquiry as a collective, human pursuit. 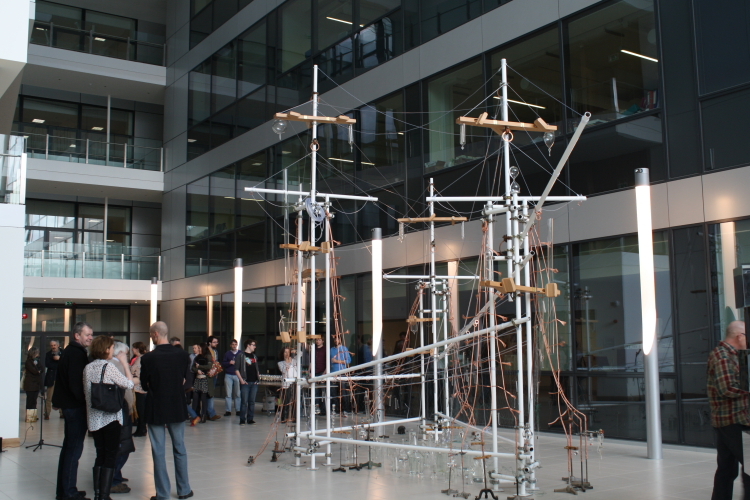 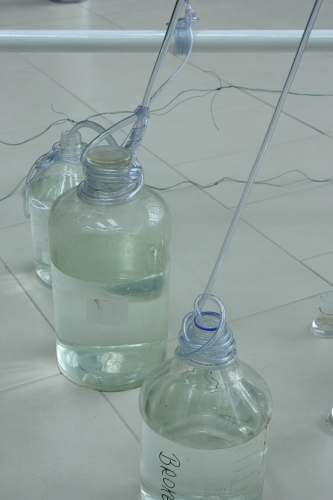 As the project progressed, its meaning extended beyond its initial inspiration to encompass the journeys, past and present, of the many students and academics who pass through the institution, each of whom making their own unique contribution to the continuity of science and the expansion of human understanding. 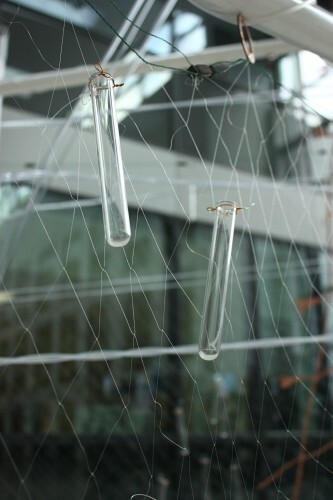 In the midst of Méadhbh’s time in UCD, a new major building for the College of Science was under construction and many transitions were taking place. She salvaged old scientific equipment that was due to be thrown out from the old laboratories as they prepared to move into the new building. 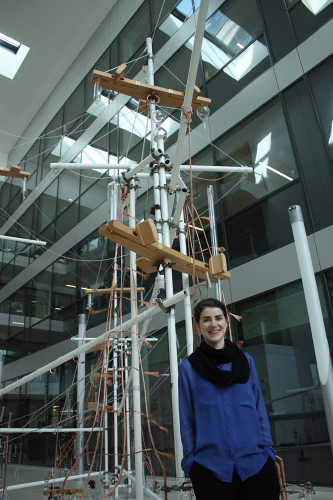 Combining these artefacts with new pieces, she built the sculpture and presented it in the new Science Centre in order to anticipate the many future stories and discoveries that will unfold there, building on the university’s history. 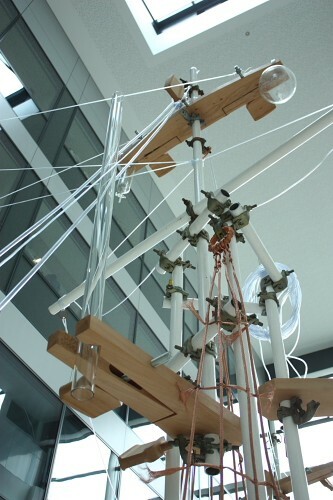 The sculpture was built with the input of many of the staff and students here who collected and donated parts and assisted in its construction. 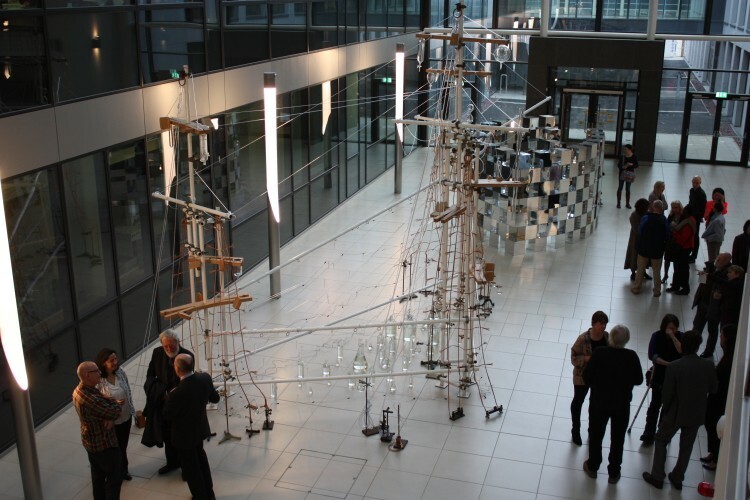 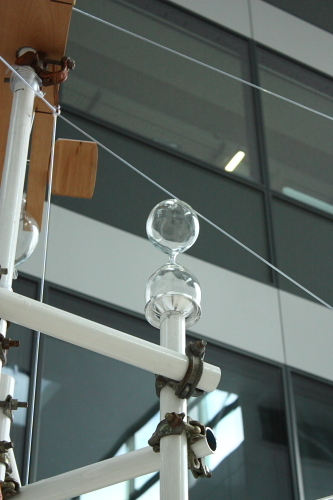 The piece marked the first major exhibition for the UCD Art in Science programme which is now a long-term project by the UCD College of Science. 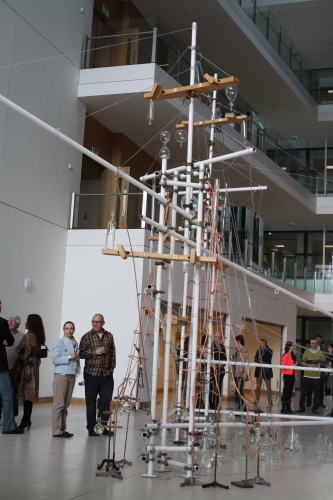 Dr. Emmanuel Reynaud, Emer O’Boyle, Prof. Lorraine Hanlon and her students, Prof. Joe Carthy, John Ryan and Dave Madigan.